Home to world-class theatre, the Ogunquit Playhouse has an 86 year legacy of creating top-notch productions complete with professional casts and creative teams, and stars of screen and stage, hand-picked for each production. On a warm summer evening in 1933, from a renovated garage in Ogunquit’s town square, the Ogunquit Playhouse opened its doors for the first time. The next 85 years would see the theatre grow into a renowned and lauded regional theatre: earning national and international recognition for its productions, in addition to having the historic building deemed a structure of National Significance on the National Register of Historic Places. 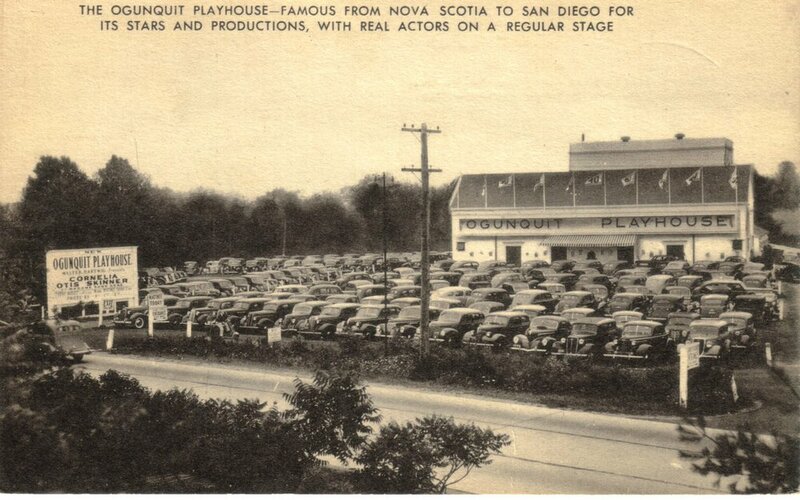 Today, the Ogunquit Playhouse has grown from a 10-week summer theatre to a true regional theatre, producing between five and seven musicals annually over a 24-week period on its own stage, as well as a holiday show at the Music Hall in Portsmouth, NH for an additional four weeks. 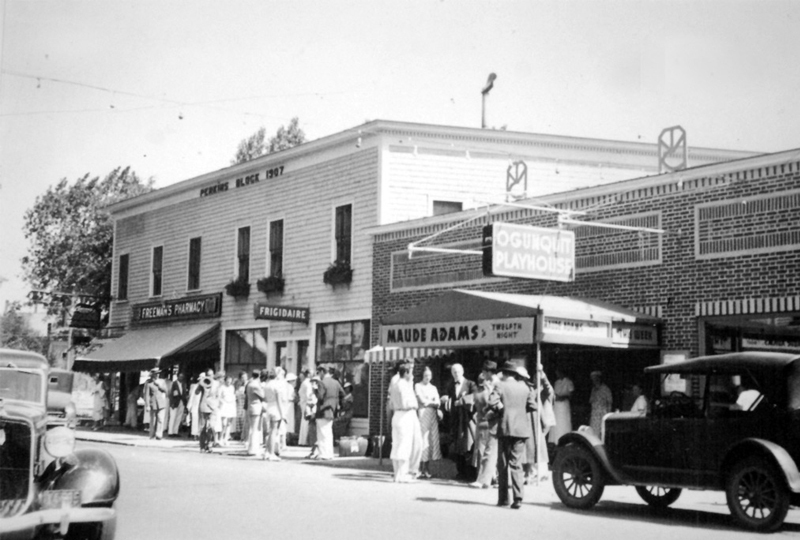 Good fortune shined upon the tiny seaside village of Ogunquit, Maine, when Broadway showman Walter Hartwig and his wife Maude arrived in town to open a summer theatre. Walter and Maude dedicated their lives to bringing first-quality theatre to venues outside of New York City as part of the “Little Theatre Movement” of the 1920s and early 30s. Ogunquit was already known for its art schools and the beauty of its natural coves and beaches. The arrival of the Hartwigs in 1933 would lead to the flowering of a successful repertory company and eventually to the Ogunquit Playhouse becoming a driving force and leader in summer stock theatre. Walter Hartwig had a following of successful stage actors as well as a host of theatre directors and producers who welcomed the opportunity to work at the new Ogunquit Playhouse. Hartwig’s reputation and connections to Broadway and Hollywood enticed many theatre legends to perform in Ogunquit, including Ethel Barrymore, Laurette Taylor, Edward Everett Horton, Ruth St. Denis, Leo G. Carroll, and Maude Adams, among others. After four years of enormous success in the converted garage, the Hartwigs bought a parcel of land, part of the old Weare Farm on Route 1, in order to build the present-day Ogunquit Playhouse, which opened its doors on July 17, 1937. 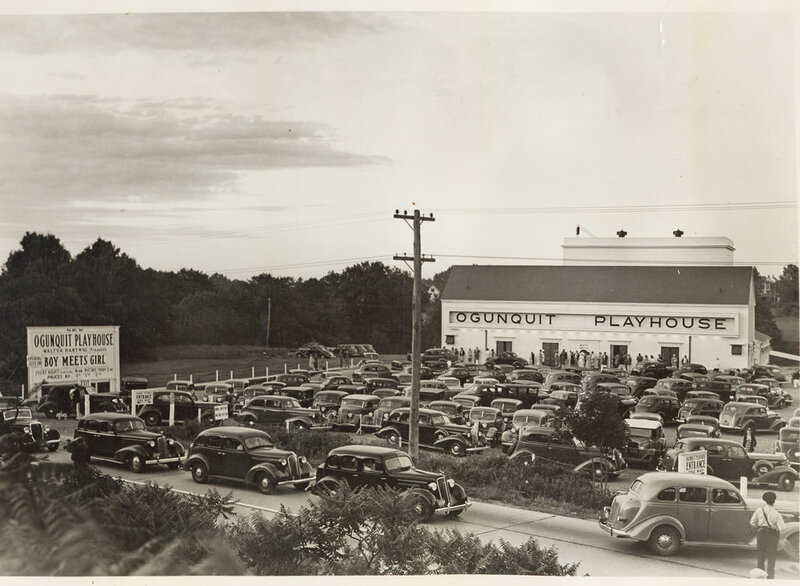 Unlike other summer theatres of its day, which were renovated barns, garages or churches, the Ogunquit Playhouse was the first, and remains the only summer theatre from the era built exclusively as a seasonal theatre. On opening night, the Playhouse was a state-of-the-art building that rivaled many theatres in New York. Walter Hartwig was a strong proponent of community theatre and he was passionate about teaching theatre craft to aspiring professionals. He started the Manhattan Theatre Colony in 1927 first in Connecticut and New Hampshire, and continued running it alongside his theatre when he settled in Ogunquit. His school offered an eight-week course designed for theatre professionals. Classes included history of drama, voice and body control, stage craft, acting, directing, stage lighting, costuming, makeup, theatrical publicity and dramatic criticism. The Manhattan Theatre Colony was also comprised of a resident repertory company, which performed at a barn behind the Playhouse and also on the main stage with the headlining stars. Students performed during WWII while Equity actors were engaged on the warfront. Long after Walter’s death, the school continued to serve as a training ground for young people pursuing careers in the theatre through the 1960s. 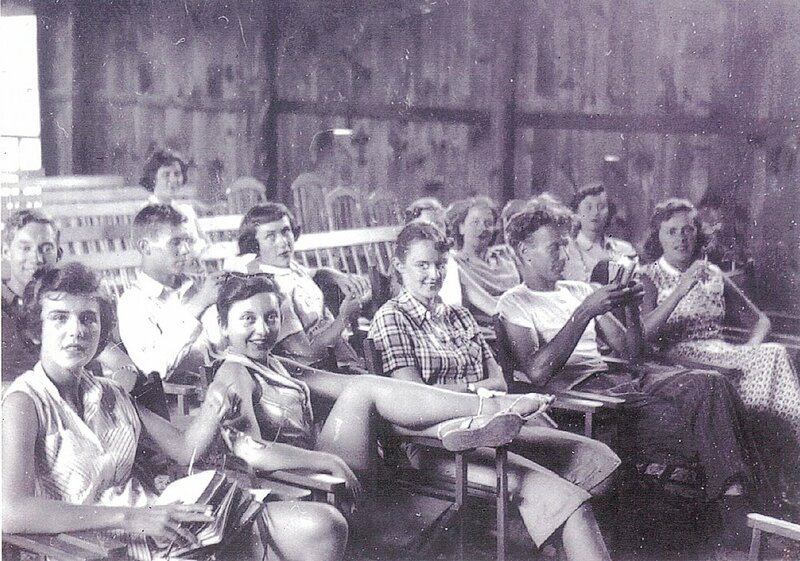 Each week, the students would mount shows in the field behind the Playhouse and perform before live audiences. With Walter Hartwig’s death in 1941, his widow Maude stepped in to carry on his legacy. The turbulent years of WWII caused many summer theatres to close forever, but Maude kept the theatre alive and well. During the winter of 1942, when her beloved Playhouse had to go dark, Maude produced shows at The Music Hall in Portsmouth, NH, to ensure audiences could see Ogunquit Playhouse productions despite the gas rationing that was preventing travel. In 1943, she reopened and ran the theatre until her retirement in 1950. In 1946, Maude Hartwig invited a young actor and U.S. army veteran, John Lane, to join the resident company of the Manhattan Theatre Colony. Never completely satisfied with being an actor, Lane did not want to star in shows, he wanted to run them. Soon, John Lane began working as the Playhouse’s General Manager to help oversee production duties. 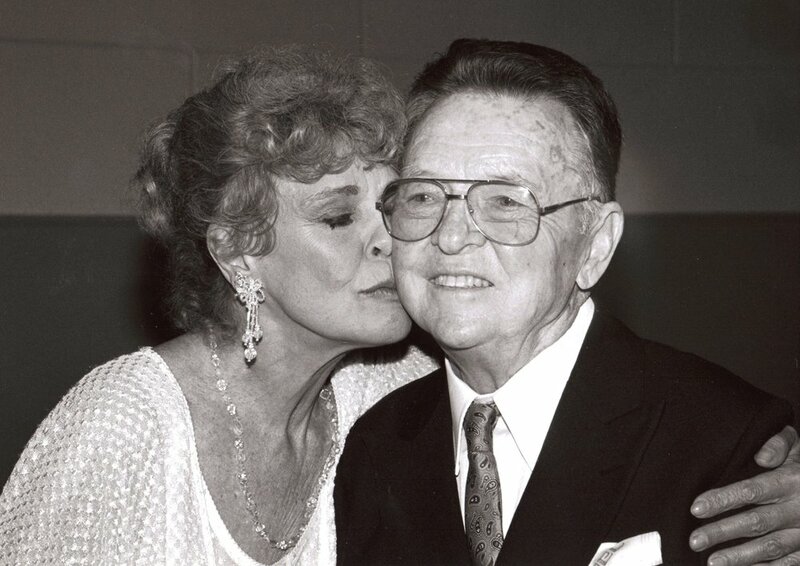 In 1950, Maude offered to sell the theatre to John Lane and he happily said yes. That year, after the Playhouse had been buttoned up for the coming winter, a hurricane caused extensive damage to the fly loft above the stage and to the auditorium. John Lane repaired the theatre in time to open the next season, although was unable to restore the fly loft. Together with his business partner, Henry Weller, the pair embarked on a long-range plan of modernizing and improving the building and grounds thereby reinventing summer theatre. 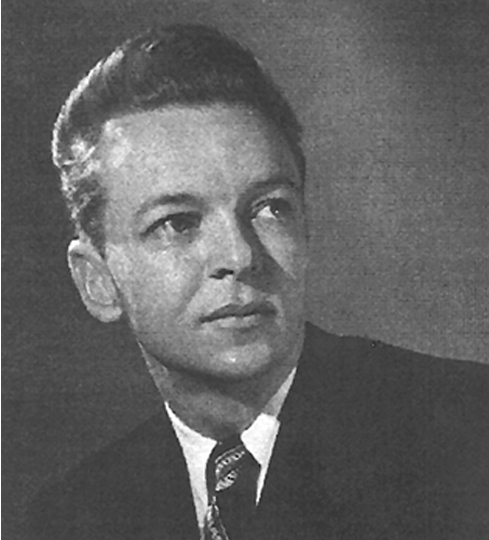 John Lane immediately became a leader among Summer Stock professionals and was instrumental in the development of the Council of Stock Theatres (COST), which oversaw the ten-week Summer Stock system that shared productions amoungst 10 theatres within a circuit. The COST theatres were able attract film, television and Broadway stars to the hundreds of summer theatres that cropped up all over the nation. Summer Stock theatre became one of the most popular forms of entertainment in the U.S. and succeeded for more than four decades. Through John Lane’s dedicated direction, professional integrity and impeccable taste, the Ogunquit Playhouse became a leader among the nation’s summer theatres allowing for generations of theatregoers to enjoy the brightest stars and finest professional actors performing in Broadway’s best shows on its stage. His years saw performances by everyone from Bette Davis, Walter Matheau, John Rait, Shirley Booth, John Ludden, Betty White, Anthony Quinn, Myrna Loy, and Lloyd Bridges, to Celeste Holm, William Powell, Vivian Vance and dozens of others prominent stars during these vibrant and thriving years. Summer Stock remained popular through the 1980s, but audiences began to decline as different forms of entertainment and venues became more popular. As a result, hundreds of summer theatres began to close across the country. By the 1990s, John Lane understood the need for ensuring that the Playhouse - one of the few remaining professional summer theatres - would survive into the twenty-first century. Before his retirement in 1994, John Lane and Henry Weller sought to perpetuate his legacy, and spearheaded the formation of the Ogunquit Playhouse Foundation, a not-for-profit 501(c)3 arts organization. After $500,000 was raised to ensure the longevity and maintenance of the theatre and grounds, Lane transferred ownership to the newly formed Foundation in 1997. 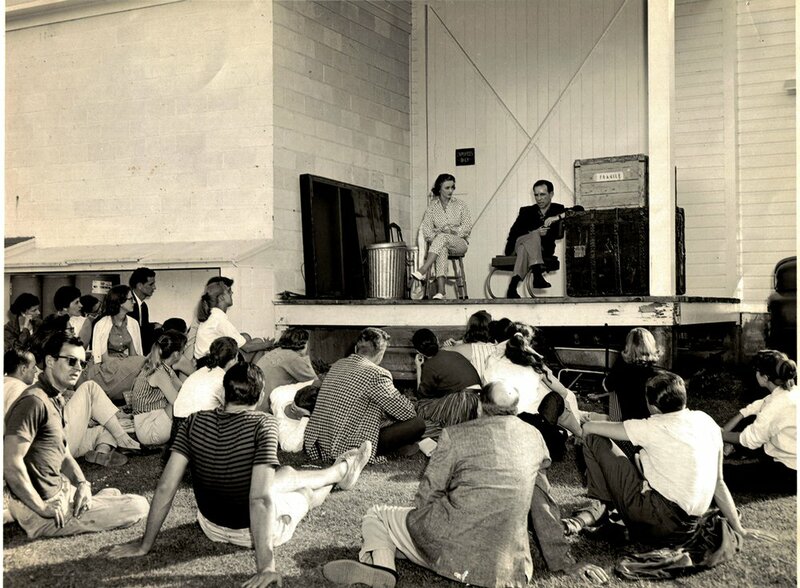 John’s extraordinary stewardship of the Ogunquit Playhouse ended after 46 years, shortly before his death in 2000. Henry Weller retired as General Manager in 1997 and went on to serve as Treasurer of the Ogunquit Playhouse Board of Directors from 1997-2003, Assistant Treasurer from 2003-2012 and then as a Board Member Emeritus until his death in 2014. Rob Townsend, long-time colleague of John Lane, led the transition of the new non-profit organization as its interim Artistic Director. In September 1999, the Ogunquit Playhouse Foundation selected Roy M. Rogosin as Producing Artistic Director for the Playhouse to build a bridge between the legendary history of the Playhouse and the exciting yet challenging future ahead. 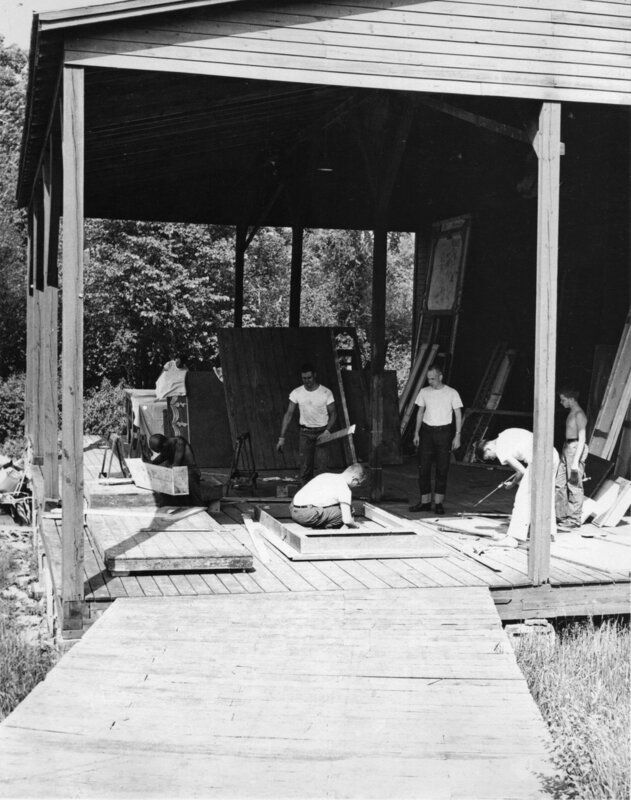 During this transition the Playhouse moved away from the declining Summer Stock model and began to produce its own shows, designing and building sets and costumes and bringing back the stars. The Manhattan Theatre Colony building was restored as a rehearsal space and the Children’s Theatre program began and prospered. A new era was ushered in when the Ogunquit Playhouse transitioned to an all-musical format and appointed Artistic Director Bradford Kenney to assume the role in 2005. Under his leadership, the Playhouse season extended further into the fall year after year, making it a true regional theatre. 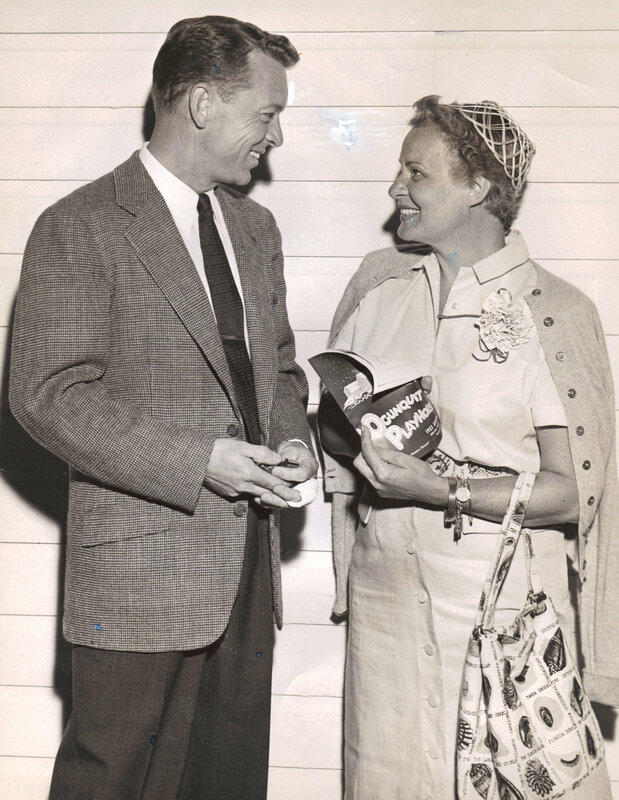 By 2014, the Playhouse season had grown from the traditional 10-week model to 26 weeks beginning in mid-May and running to the end of October, with an additional holiday show produced for The Music Hall stage in Portsmouth, NH in December – the same stage where Maude Hartwig produced one season of Ogunquit Playhouse shows during WWII. Through Bradford Kenney’s stewardship, many accomplishments and milestones have been reached for the Ogunquit Playhouse. Together with the staff, Board of Directors and volunteers, the Playhouse has expanded the boundaries of what it means to be a summer theatre. Every Director, Choreographer, creative team and cast member is hand-picked for each show. The result has been sold out performances, critical acclaim, and annual attendance that has grown from approximately 40,000 to over 100,000. Along with the extended season and audiences, the stars have returned as well. Tony, Emmy, Golden Globe and Academy Award winners, along with such stars as Sally Struthers, Stefanie Powers, Jefferson Mays, Carson Kressley, Valerie Harper and many others have come to perform in its acclaimed productions on the legendary stage. As a result, the Playhouse has grown to be one of the largest non-profit arts organizations in the state of Maine and throughout New England. Countless milestones and achievements have occurred over the last decade. Cameron Mackintosh selected the Playhouse to produce the first fully staged production in the Northeast of the musical The Witches of Eastwick. The Ogunquit Playhouse was also the first regional theatre in the country to produce Billy Elliot the Musical which went on to win four IRNE (Independent Reviewers of New England) Awards marking the first IRNE wins for the Playhouse. The Ogunquit Playhouse received the prestigious Moss Hart Trophy for its 2013 production of West Side Story. In 2014, the Ogunquit Playhouse’s listing in the National Register of Historic Places was raised to the “National Level of Significance” in consideration of the significant contributions made by its founder, Walter Hartwig, and the Playhouse to performing arts education throughout the nation. The Ogunquit Playhouse was deemed and recognized for consistently living up to its reputation as “America’s Foremost Summer Theatre,” in large part because of its influence on American theater and all those who participate in it. In 2016, the Ogunquit Playhouse launched a New Works Program, with a staged reading of Frida in New York City, which was followed by a staged reading of Mr. Holland’s Opus the next year. Fostering new works and pre-Broadway productions continued on the Playhouse stage, with the 2017 World Premiere of Heartbreak Hotel and through a partnership with the Fingerlakes Musical Theatre Festival on the continued American rollout of Sir Tim Rice’s new musical From Here to Eternity. Building on its history in performing arts education, over the last ten years the Playhouse has also developed and offered special performances for middle and high school aged children, as well as began the arduous process of restoring and renovating the eighty-year-old building by investing in a new steel support system for the stage house section of the theatre to support both the building and a new rigging system, installed a new state-of-the art sprinkler system and expanded the loading dock to allow the safe storage, loading, and unloading of the sets. This is just the beginning. There is much still to do in these areas. With Bradford Kenney’s foresight and leadership furthering the commitment to preserve the Playhouse for future generations, the Ogunquit Playhouse, with its growing international reputation, continues to produce and showcase Broadway-caliber musicals on its historic stage. Bradford Kenney, the Playhouse staff, and Board of Directors are dedicated to bringing audiences the newest show titles, beloved classics, as well as brand new and world premiere shows, and are proud to now foster new works for the musical stage. The list of stars that have appeared on our stage reads like a who's who of the American theatre. Look back on all the shows that have graced the Playhouse stage, from 1933 to today!